The organizers of Slamapalooza, KPU’s monthly poetry slam competition, have some big things planned for the new year. The slam team—as well as the trip they take to the Canadian Festival of Spoken Word, where Slamapalooza poets compete with other teams from across the country—has long been helmed by Simon Massey. For years he has coached the team, booked the feature poets, and lobbied for the slam’s funding. But 2019 will see Massey pass the torch to two newer members of Slamapalooza: creative writing majors Chelsea Franz and Tawahum Bige. Traditionally, Slamapalooza’s events are somewhat sparsely attended. 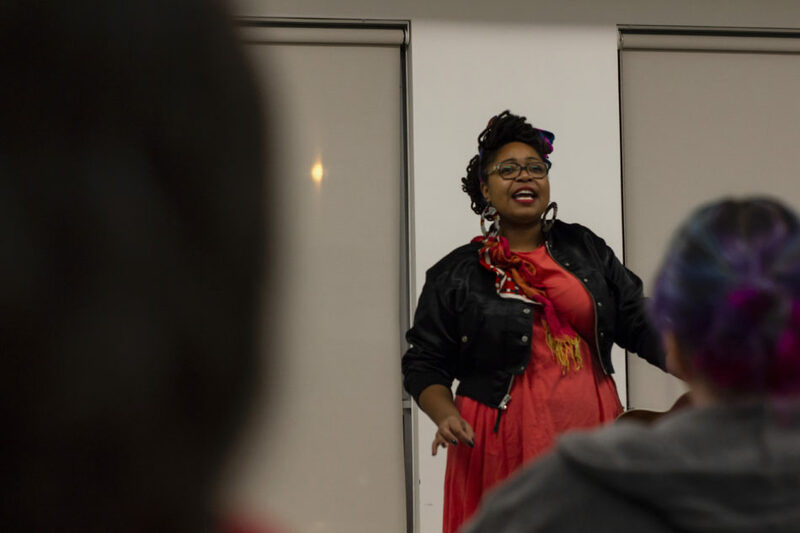 The poetry slam’s fanbase is consistent, but shifting locations and last-minute schedules would occasionally make attending or competing in the slam difficult. The most recent event, however—held in December and featuring famed Vancouver poet Jillian Christmas—saw a relatively higher turnout than average. Franz and Bige, who took part in promoting the slam, helped cause this improvement. “I want this attendance to be [the] minimum,” says Franz, about the December competition. She and the other organizers of Slamapalooza agree that their ideal event would be so well-attended that the audience would not be able to fit into Birch 250, the student space on KPU’s Surrey campus which has been home to the slam as of late. Instead, they would move back to the Grassroots Cafe, the original home of Slamapalooza. The organizers also stress the importance of using word of mouth to expand the on-campus spoken word community. Reaching out to creative writing classes, IDEA classes, and other groups with an interest in poetry—as well as collaborating with the Kwantlen Creative Writing Guild, and building their own social media presence—have been brought up as ways to improve Slamapalooza in the new year. For his part, Tawahum says he will largely be offering the slam “tertiary support.” Because he is still interested in competing in the events, he cannot take part in selecting judges or making decisions about payment. His participation will mostly be focused on improving outreach. “I’m totally fine not competing, so I’m willing to take over eventually,” says Franz, who will become the new host of Slamapalooza later this year. Tawahum stresses the value of sending poets to the Canadian Festival of Spoken Word. “We have so much potential here,” adds Franz.